Dalla Terra, a lovely Italian wine bar in St Martin’s Courtyard in Covent Garden, set up shop about three months ago. Its focus is to offer a wide variety of quality (and predominantly Italian) wines – some 180 bottles and 30 by the glass – and a simple but delicious food menu in a welcoming setting. For the heart of Covent Garden, wine prices were reasonable with a Billecart-Salmon Brut Reserve champagne costing only £10. Chef Araldo De Vitis, who previously worked at St John Bar and Restaurant, has come up with a small menu of delicious tasting dishes to match the wines. 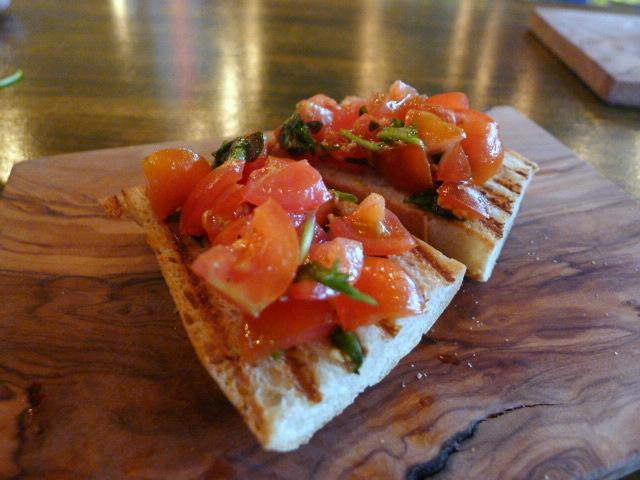 The menu was well thought out and included simple delights such as a selection of bruschetta that featured cherry tomato with rocket and oregano which offered freshness and bite, and spreadable “Ventricina di Campotosto” salami with broad beans and pecorino which was rustic and hearty (£3.80). 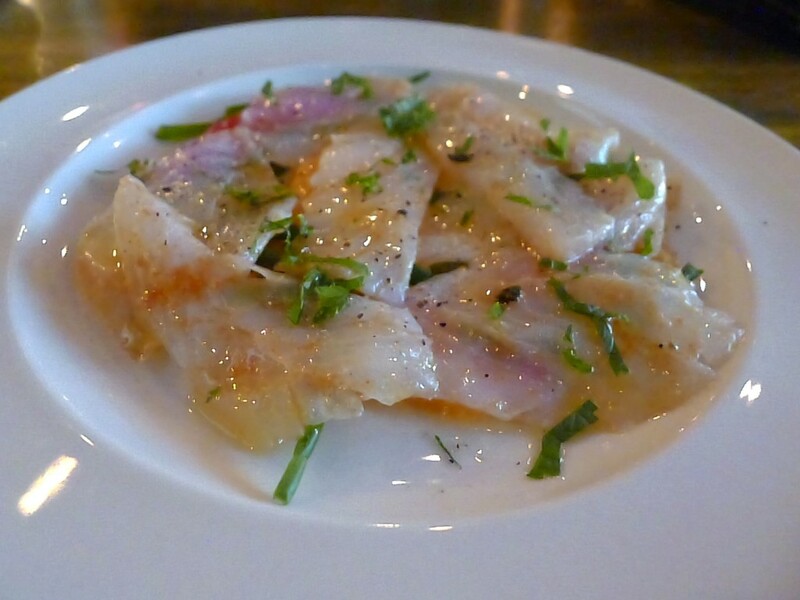 Marinated haddock (£9.45) was delicate and tasty, and well matched with the lovely sweetness of some roasted peppers, crunchy samphire and aromatic mint. To go with the wine Sommelier Francesco, who selected all our wines for us, came up with a Simcic Pinot Grigio from Slovenia (125ml – £6.25, 175ml – £7.95) which worked well with the fish with its complex aroma and flowery bouquet. 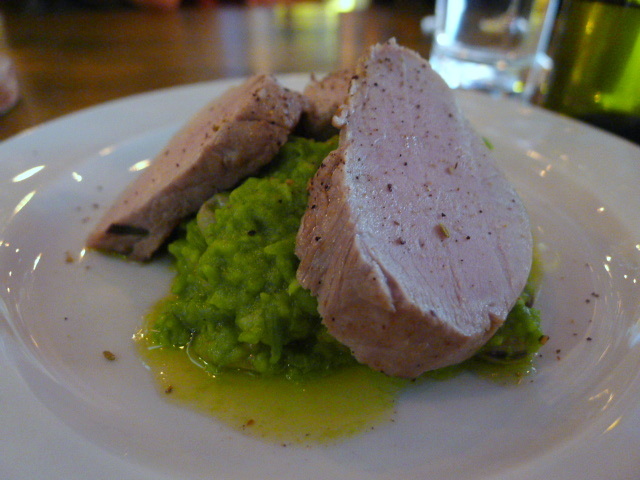 Confit pork fillet medallions (£7.60) were tasty and served with crunchy broad beans and a lovingly sweet green pea purée. 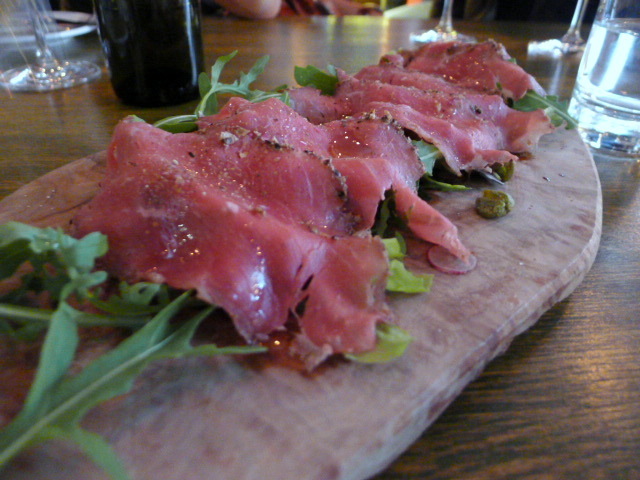 But it was the beef carpaccio (£12.60) which stole the show. Marinated in a complex mixture of salt, rosebuds, orange peel and other secret ingredients, the beef boasted of an amazing flavour and was incredibly tender. To finish off the dish was a garnish of snappy rocket and a delicate truffle oil dressing. A Sardus Pater Carignano del Sulcis Arruga Superiore 2007 from Sardinia (125ml – £11.95, 175ml – £13.95) proved a good match for the meats with its elegant finish. 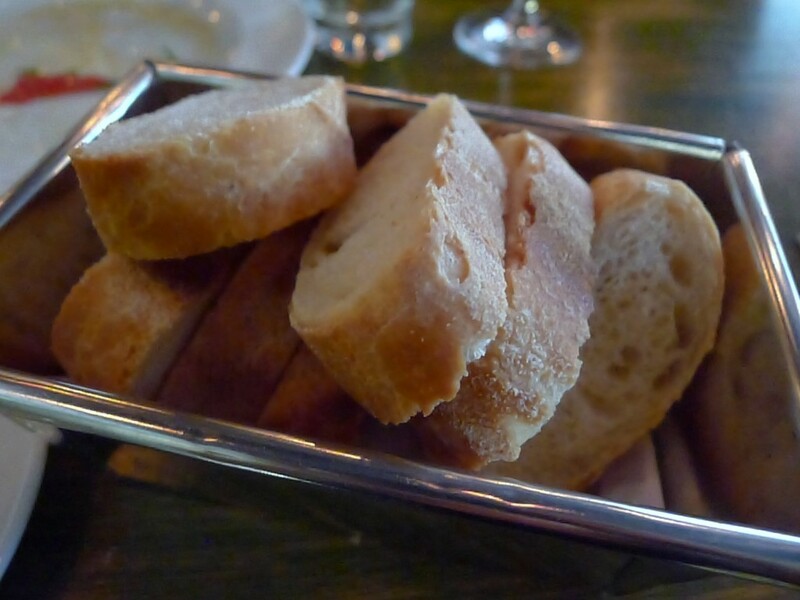 Also impressive was the super crunchy homemade baguette which was made from a 29 year old mother yeast. 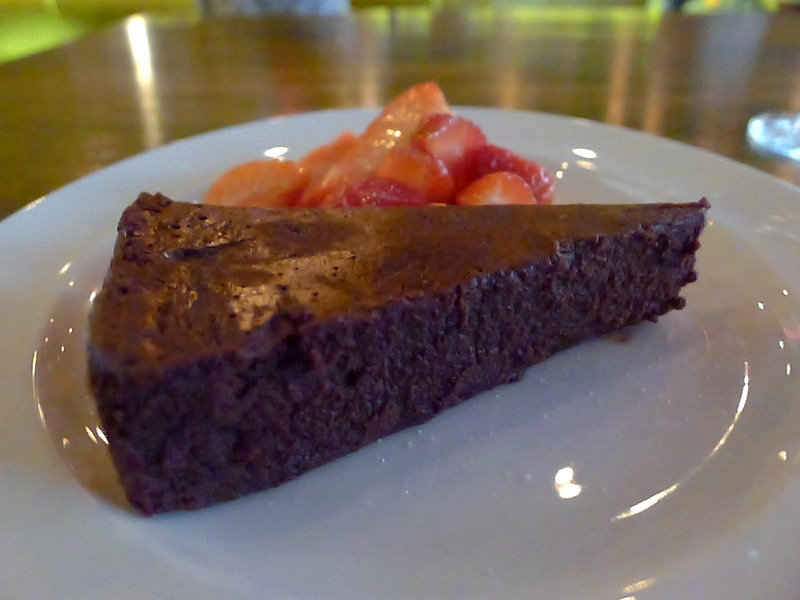 For dessert, a flourless chocolate cake (£4.95) was rich, decadent and delicious. Franz Haas Moscato Rosa 2010 from Alto Adige (50ml – £7.95) was a winning accompaniment with its explosion of fruity notes. A sleek, modern outfit, Dalla Terra opens up attractively over the courtyard for an open air feel, ideal on a sunny summer’s day. This is a place for lazing while enjoying some lovely food and some cheeky glasses of wine. Dalla Terra is a winning and affordable addition to Covent Garden and should feature on most people’s ‘to-go-to’ list. Price range: Tasting plates start range from £5.90 to £14.95. Wines by the glass range from £4.95 to £19.95. I am always on the look out for lovely Italian places to try. Italian as it happens is my favourite food. I am definitely adding this to my must-go-to list. Cheers!